Readers Questions: I’m pretty good at finding data at FRED. But I have no luck finding what I want at ONS. Do you have a post on that? Or some guidelines that might help me? Would be great! It’s a good question. I’ve spent the past four years finding my way around the ONS database and website (and updating links the last time they changed URLs). I’ve spent many hours looking for certain statistics. The good news is that nearly all the important ones are there, if you dig hard enough. Though some data like exchange rates, bond yields, interest rates and money supply you will need Bank of England database. Sometimes it’s frustrating because all you want is the % change in real GDP, and you have to wade through statistics on S.A Output in fishing and forestry. In some cases, other sources of data are better, e.g. for housing I still think Nationwide is better than the ONS, though the ONS seem to be giving housing more importance. I subscribe to the ONS RSS feed so I can see when new publications come out. In recent releases, you often only get data from the past 3-5 years. But, I usually want data going back 10 or 20 years. Suppose we want real economic growth. click on data menu tab. 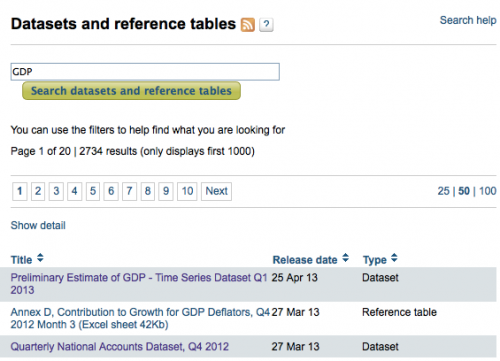 To get real GDP, you need to know real GDP is C2: GDP at chained volume measure. 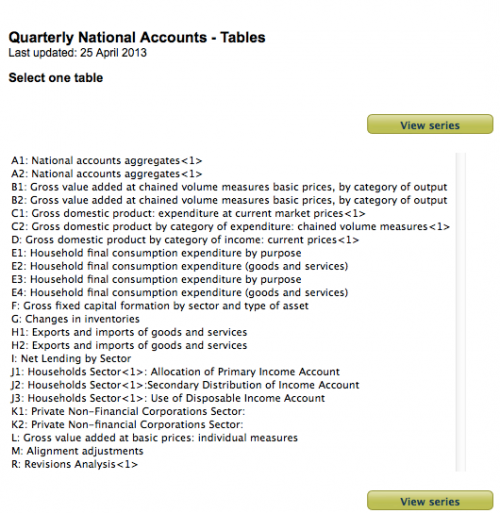 This entry was posted in economics and tagged stats. Bookmark the permalink. ← The UK’s weak recovery – What counts as success these days? Thanks for the invaluable service you perform! !